Before the third week of Lent is over, I wanted to share with you a reflection I wrote for Charis Ministries on last Sunday’s gospel reading. I got connected to Charis via Twitter and one of their partner program coordinators who lives in Georgia, (Hi Becky!!) even thought they’re based in Chicago, so I think that’s pretty random and cool! Anyway, happy reflecting!! The words of John’s gospel today may be familiar ones to us. I’ve heard this passage countless times to show that “even Jesus got angry” and to (rightfully) justify outrage at injustice and disrespect of the Lord. But sometimes I think we are kidding ourselves. We hide our self-righteous pride behind Jesus’ righteous anger. We stand in condemnation with Jesus, ready to point out the hypocrites in church, ready to point the finger at what everyone else is doing wrong. But maybe we should consider this story from another angle, the angle of the temple, because each of us is a temple of God. We don’t want to believe that we are overrun with the likes of oxen, sheep, doves, and money changers. How blasphemous! But what if we knew that the oxen, sheep, and doves in the passage were being sold for sacrifice in the temple, a common practice of the day? And what if we realized that the moneychangers were there so you could pay the temple tax, not something that would immediately be recognized as out of place? Surprisingly for us, they might actually appear to belong. And that is how it is with us… Click here to continue reading. So, when I wrote my Advent reflection for Amate back in December, I had no idea how helpful and prophetic it would be for my own life. It has the Holy Spirit written all over it, because it’s been exactly what I needed during these last few months (in addition to the love and support of so many wonderful people of course). But I know the Holy Spirit was at work. In case you haven’t read the reflection (go here if you want to! ), the main format was, “These things A,B, and C try to steal my hope” but “these things D, E, and F remind me to choose hope.” However, when I originally wrote the reflection, I wrote, “I have hope because of D, E, and F….” not “I choose hope because of D, E, and F.” But two days before the Advent reflection night, when we were practicing it as a house and right before my turn, I leaned over to one of my wonderful housemates and crossed out have and wrote choose, and then wrote a big ????. She gave me an encouraging nod, YES. Oh how much I love this! 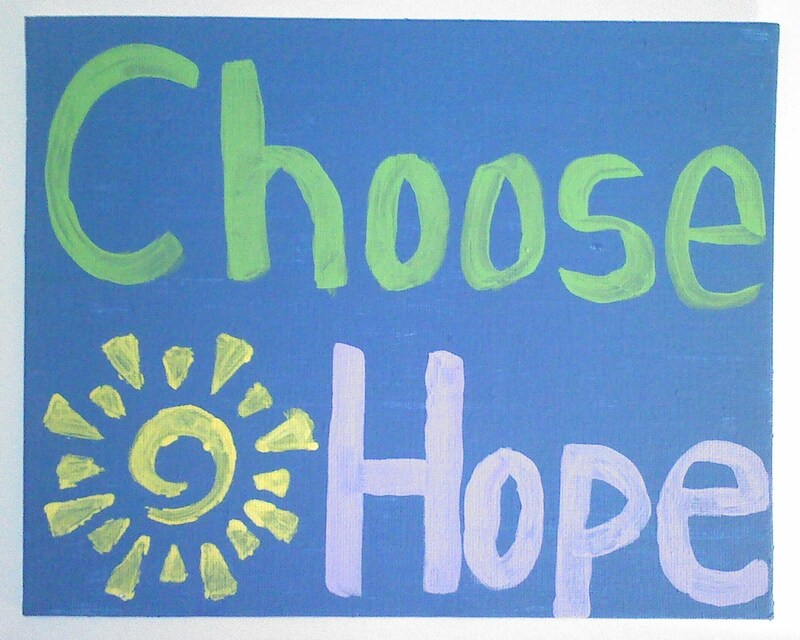 I made this at our winter retreat as a reminder to make the daily choice to "Choose Hope"